The stage all ready for celebrations to begin at my school! One of the things I’ve noticed since coming to Moldova is that just because we don’t celebrate many international holidays (International Day of Peace, International Women’s Day, International Teacher’s Day) very much in the United States, they are actually a pretty big deal elsewhere. Two Wednesdays ago (October 5th) was International Teacher’s Day, which is widely celebrated in Moldova. Here, it is called Ziua Profesorului. Usually, this day is celebrated at the school with shorter lessons followed by a concert given by students and then a masa (special meal) and party for just the teachers. 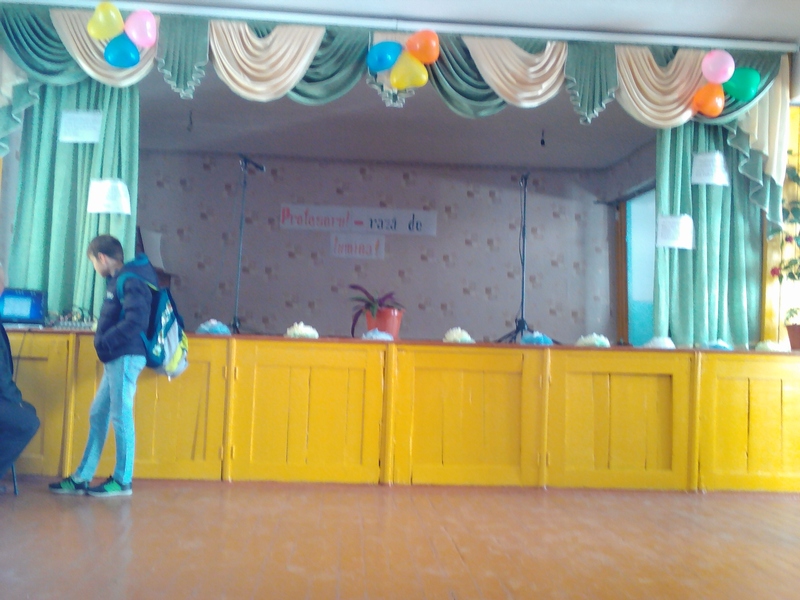 My raion (district) had a special day in the raion center, so my school waited to celebrate until Friday, while about 10 of the teachers, including me, headed to the raion center for the “celebrations” there. The first 2 hours of the celebration consisted of the giving of various certificates to teachers from throughout the raion. As each teacher made their way to the stage, they played music and there was an over-all joyous sound to the music. My favorite was an Abba song. I also found the synchronized clapping from everyone in the audience a bit amusing. Once all the certificates had been handed out, the event turned into a concert. Various groups of students and teachers sang, danced, and played instruments. 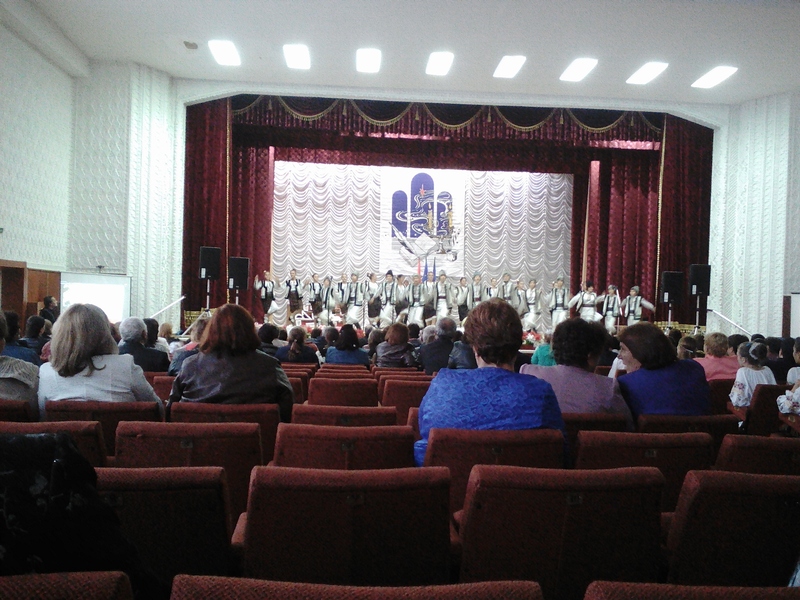 My town has a really good traditional music and dance school, and my students were the last act of the event. About 30 of my students danced, and another 2 accompanied the dancers with instruments. They did an amazing job and I was so proud of them. I may be biased, but I think they were the best act of the concert. They’re talented! It was also a reminder that many of my students have a lot things taking up their time after school hours. Many of the students that are in the dance group are also the students that almost always have their homework completed. I realized that sometimes, when they haven’t completed their homework, they may have just not had the time to do so, even if they wanted to. The beautiful masa for the teachers at my school. On Friday, our classes ended a bit earlier than usual, and all of the teachers gathered in the cantina (cafeteria/auditorium). One of the 8th grade classes had prepared a number of poems and songs, which they performed, and then they gave each of us a rose. They headed out, and then our masa began. There are about 20 teachers at my school, and I think almost everyone was there. 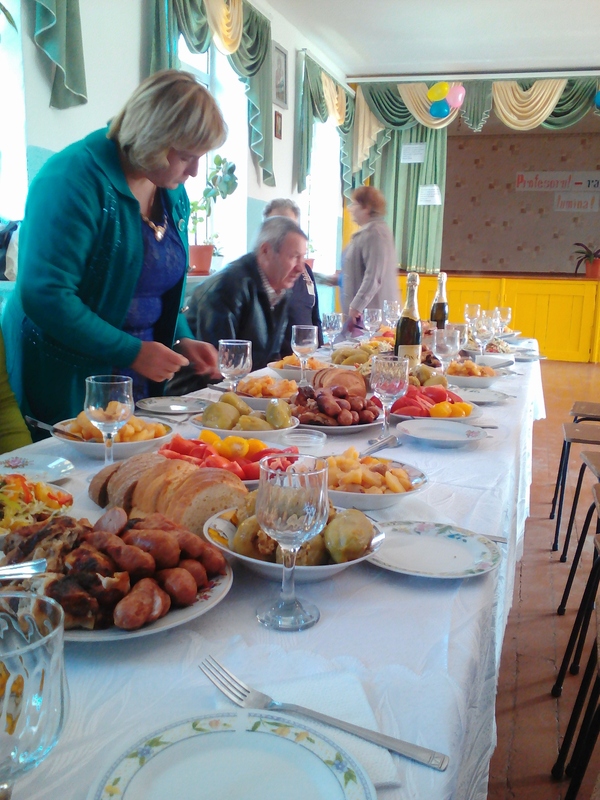 The teachers had all pitched in money and had helped prepare the food. It was a nice, fancy masa, despite being held at school. And, of course, there was plenty of champagne and wine to go around! Towards the end of the meal, several of the older teachers decided everyone needed to sing a song together (it was either a song about school in general, or a school song). About halfway through the song I realized I didn’t recognize any of the words being sung. After, my partner teacher explained it was in Russian. Overall, it was a yummy, fun masa.